Teresa was born July 20, 1969, in Bakersfield, CA . She passed away March 27, 2019 in Los Angeles, CA with her family by her side after a long battle with Pulmonary Hypertension. 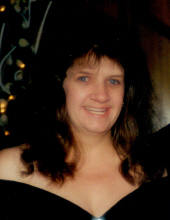 Teresa is survived by her loving son, Philip Wolfe and his fiancé Sarah; parents, Robert and Dianne Stewart; brother and wife, Bobby and Krystal Stewart; niece, Taylor; nephew, Brody; grandmother, Doris Miller; extended family and special friends, Tony Pacheco and Stephanie Thrasher Lamas. Teresa enjoyed BBQ's with family and friends. She loved cooking spaghetti dinner for her brother and his family. Teresa loved her trips to the beach, Morro Bay. Teresa was active with the Pulmonary Hypertension Support Group. In her younger years, she spent most of her time riding horses with her grandpa, dad and brother. Everyone that knew Teresa, knows that she had a colorful vocabulary but was the sweetest person. She would help anyone if she could. Memorial Service is Friday, April 5th, 2019 at 11am at Peters Funeral Home Chapel, Shafter, CA. In support of Pulmonary Hypertension Awareness, please wear purple to Teresa’s Memorial Service. To send flowers or a remembrance gift to the family of Teresa Ann Wolfe, please visit our Tribute Store. "Email Address" would like to share the life celebration of Teresa Ann Wolfe. Click on the "link" to go to share a favorite memory or leave a condolence message for the family.